In August 1905, the Fort Omaha post was reestablished with a new mission. 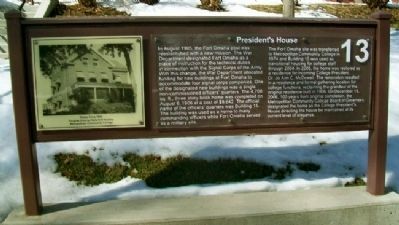 The War Department designated Fort Omaha as a place of instruction for the technical duties in connection with the Signal Corps of the Army. With this change, the War Department allocated funding for new buildings at Fort Omaha to accommodate four [S]ignal [C]orps companies. One of the designated new buildings was a single non-commissioned officers' quarters. The 4,700 sq. 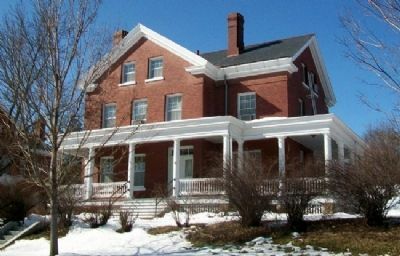 ft., three story brick home was completed on August 6, 1906 at a cost of $9,642. The official name of the officers' quarters was Building 15. 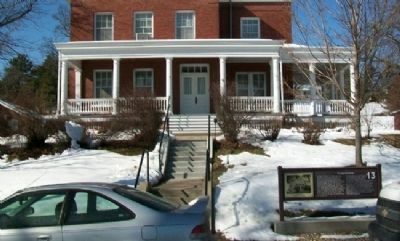 The building was used as a home ot many commanding officers while Fort Omaha served as a military site. 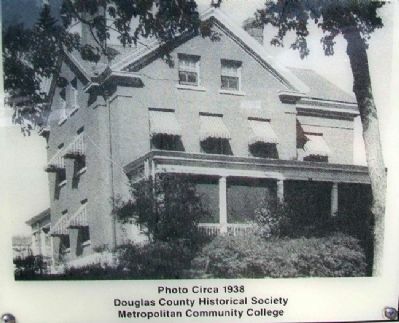 original completion, the Metropolitan Community College Board of Governors designated the home as the College President's House directing the house be maintained at its current level of elegance. Location. 41° 18.57′ N, 95° 57.611′ W. Marker is in Omaha, Nebraska, in Douglas County. Marker is on West Road, on the left when traveling north. Touch for map. Marker is in front of Building 13 on the Metropolitan Community College campus. Marker is in this post office area: Omaha NE 68111, United States of America. Touch for directions. Other nearby markers. At least 8 other markers are within walking distance of this marker. Crook House (within shouting distance of this marker); Fort Omaha Officers Row (about 300 feet away, measured in a direct line); General Crook's Headquarters at Fort Omaha (about 400 feet away); Fort Omaha Balloon School (about 500 feet away); History of Fort Omaha (about 700 feet away); Observation Balloon Training at Fort Omaha (about 700 feet away); Quartermaster's Office and Commissary (approx. 0.2 miles away); Fort Omaha Knights of Columbus Assembly Hall (approx. 0.2 miles away). Touch for a list and map of all markers in Omaha. More. Search the internet for President's House. Credits. This page was last revised on June 16, 2016. This page originally submitted on August 7, 2012, by William Fischer, Jr. of Scranton, Pennsylvania. This page has been viewed 431 times since then and 3 times this year. Photos: 1, 2, 3, 4. submitted on August 8, 2012, by William Fischer, Jr. of Scranton, Pennsylvania.